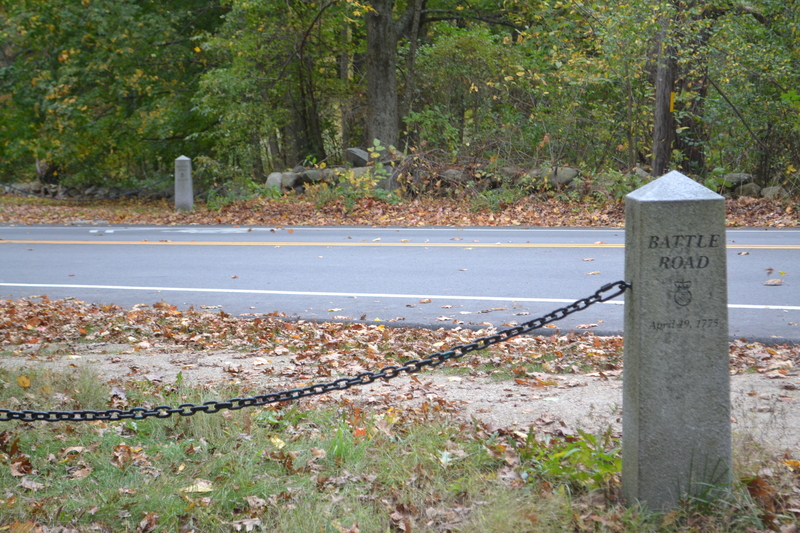 One of the endpoints of Massachusetts Avenue is Minute Man National Park. There’s no sign signifying it’s end or celebration that you are about to embark on a 15 mile long road, but merely just another, typical intersection dead-end. Continue right to go west and head to Concord, Mass., continue left and head east toward Boston. 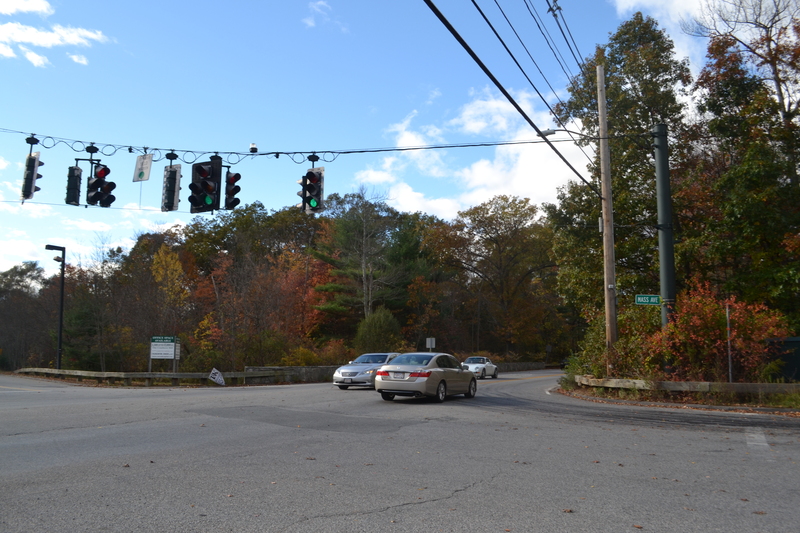 Continue straight and go directly to Minuteman High School (a vocational school). I mean, it is just a street after all. Turn right or left head down Marrett Rd. Turn around and head back into Minute Man National Park. Turn around and head straight back into Minute Man National Park, the only national park in the state. As Jamie (my partner on this project) and I walked through the park on our quest to find the end/beginning of Mass. Ave. the fall foliage was in full bloom. We wanted to go in October, before the all the leaves fell, but after some already had. Hearing some of the last crunching sounds our feet would make in the fall before the the ground beneath us turned to ice, leaving the once array of yellow, orange and red leaves to turn to mush. Right before we reached the end/beginning of Mass. Ave. But first, let’s go back to the beginning of our hunt. Taken from a parking lot at the national park, telling us how far we were from the info center. We saw the sign for the national park visitor’s center, but decided to pass that too – we were hungry. We took 2A all the way to Concord, where we got ourselves an Italian sub and decided only now could we start our search for the end of the street we have grown to love. Still not really knowing where our journey should begin, we parked in the visitor center parking lot. We got our journalist notepads and I had my camera while Jamie had his audio tascam. 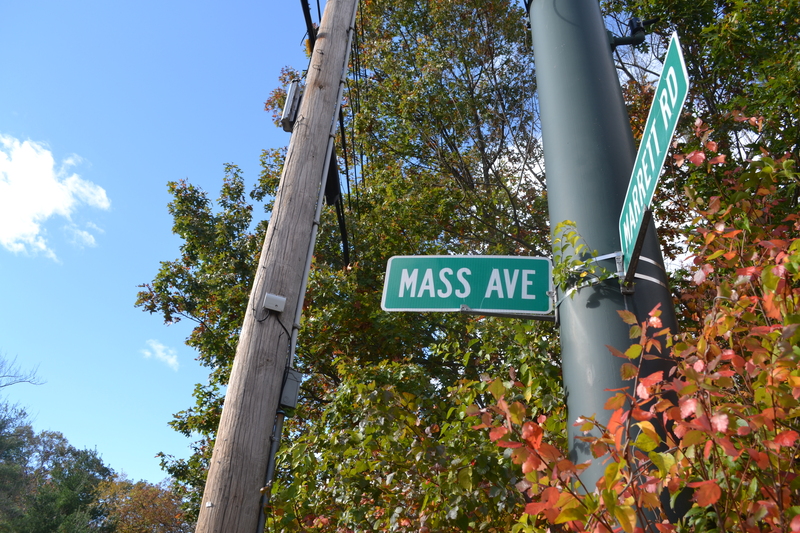 Our goal was to do some interviews and find out why it was important that Mass Ave. began (or ended) in such a historic national park – one that has roots in the beginning of our nation’s history. But, you know, plans change. 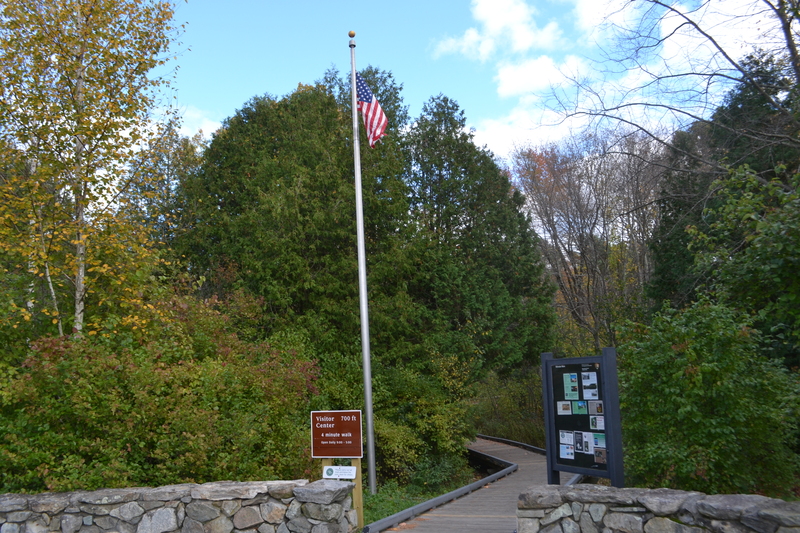 Path leading to the visitor center. I always get excited when I see the brown national parks signs. It makes me feel like I am walking into a living Ken Burns documentary. I haven’t even been to very many national parks (actually this one may be my first! ), but nonetheless I have an affinity for them. There is just something cool about seeing passionate park rangers explain minute details about something that really matters to them to tourists or even locals. But, I digress. 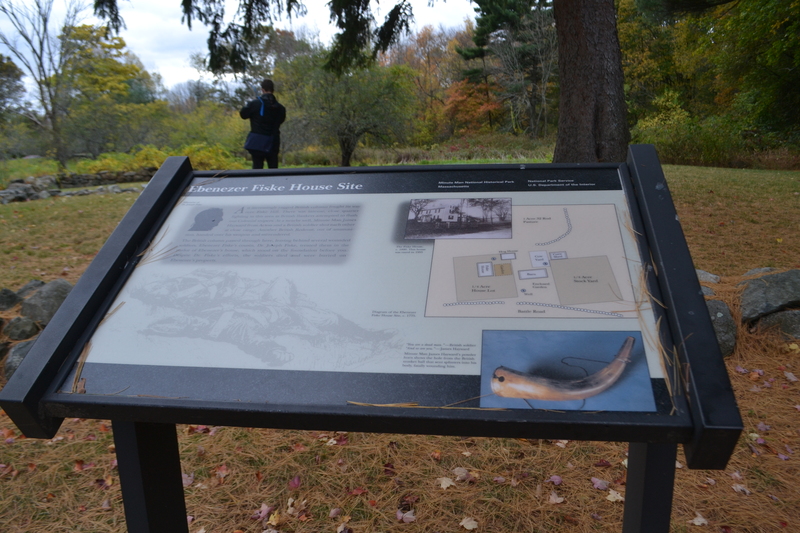 The brown sign told us we had a precise 4 minute walk to the visitor center that was 700 feet away. After some grumblings from Jamie about the walk, we decided we needed to start at the visitor center – that was where our first interview would take place. I have trouble just seeing scenery around me without taking endless amounts of photos and this was one of those moments. 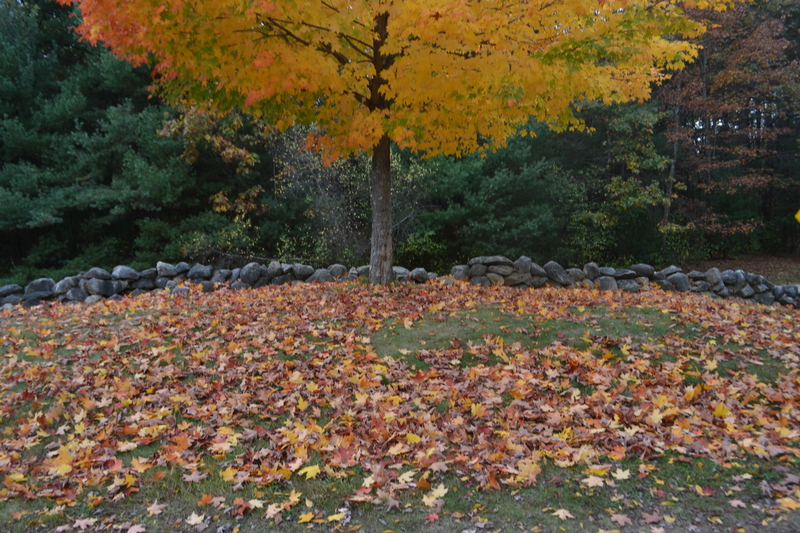 I have been in New England for 6 years and I am not sure I had ever seen foliage like this. 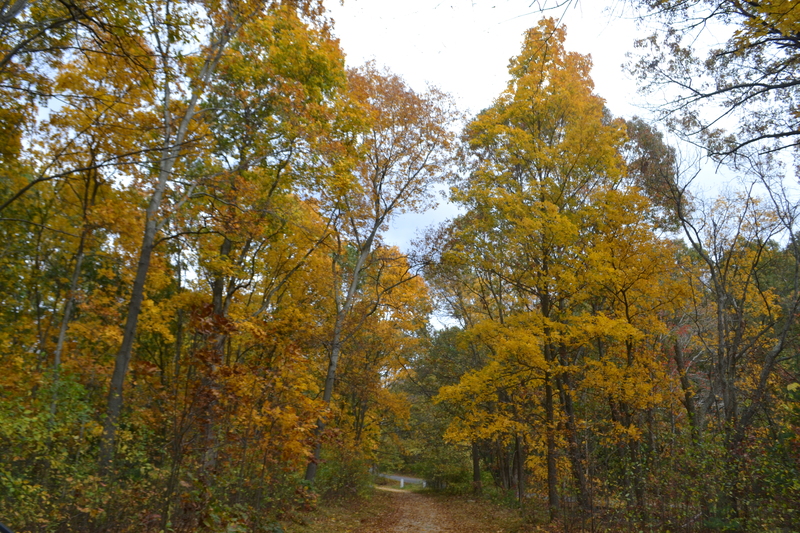 Walking down a little wooden path to a visitor center, I thought this is it! This is why I moved from sunny California, for days like today. The wood panel building was enough to make the history nerd in me throw a party. And that was before we even walked inside. We were immediately greeted by a park ranger, who was willing to offer us endless amounts of historical facts and an informational video that would be starting in 5 minutes. Much to my dismay, Jamie reminded me we were on a mission for Mass. Ave. so we skipped the video. We were going to interview a ranger about the importance of Mass. Ave. ending in the park. 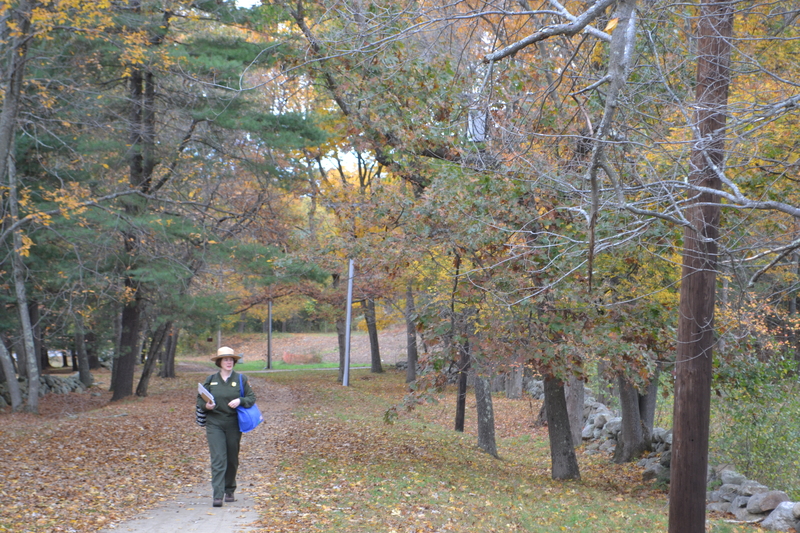 The park ranger, though extremely knowledgeable, did not have much to say about Mass. Ave. itself, so we decided to take the road less travelled and just find the beginning/end ourselves. So, we took off and exited the side of the visitor center into the park. I wish I could say we went all Jack Kerouac and didn’t use a map or didn’t have a plan, but that would just be a lie. Both of our smart phones were out with shoddy service, zooming in to the end of Mass. Ave., twisting and turning our way through the park. 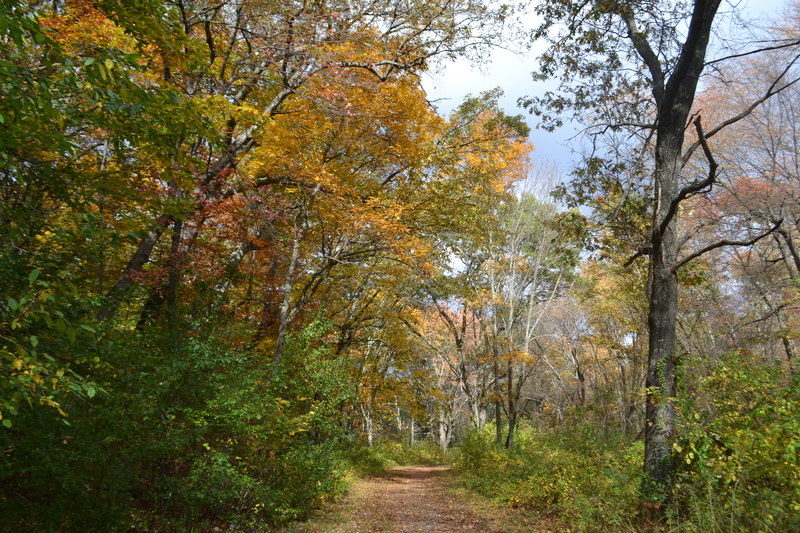 For most of the way, there was nothing around us other than trees and a casual jogger or walker. It wasn’t tourist season and it was fairly cold – so our quest was done mostly alone. We came across the Whittemore House, which is one of the few standing buildings left from the time of Battle of Lexington and Concord. We came across little memorials and tributes to those who gave their lives. But, most of the time, it was easy to forget the men here who lost their lives. According to The History Channel, 700 British troops came to Lexington on April 19 facing 77 militiamen. 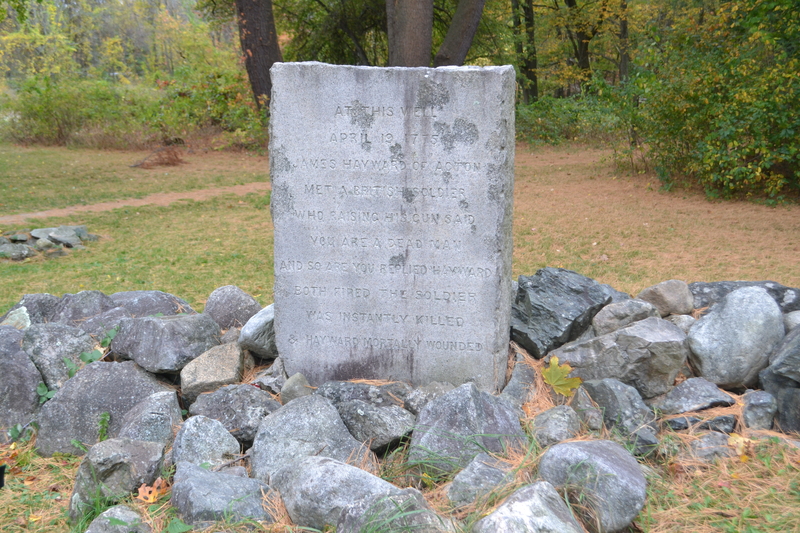 One shot was fired – no one knows from which side – and the British continued west to Concord, soon turning around to head back to Boston. In the time they got to Concord, the militia, also know as Minute Men, for being ready at any moment, prepared for battle and were ready for their return. 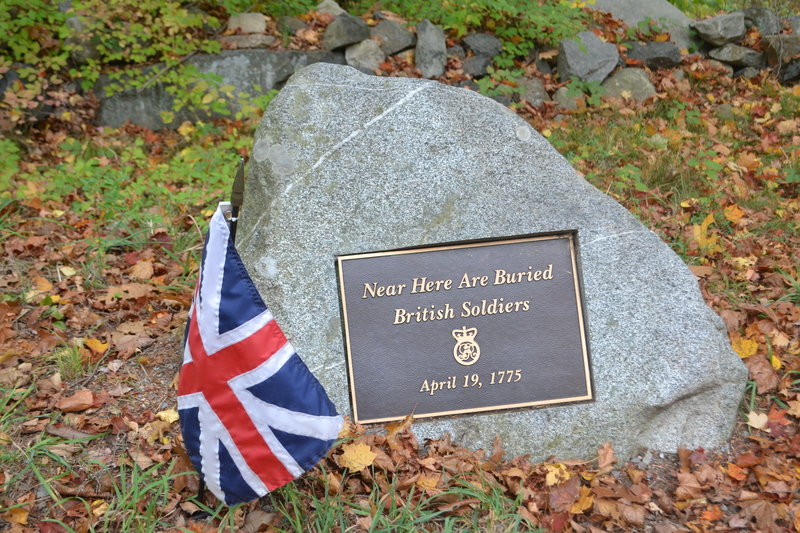 In the course of the battle, 250 Redcoats, or British died, and 90 militia died. It was the first battle of the American Revolution and the first step toward American freedom. Today, it is easy just to see the foliage. After looping our way through the path, we finally (almost) reached our beloved street. We were on Wood Street and after a quick right and a short walk down, we reached Mass. Ave. and were almost to the beginning/end! 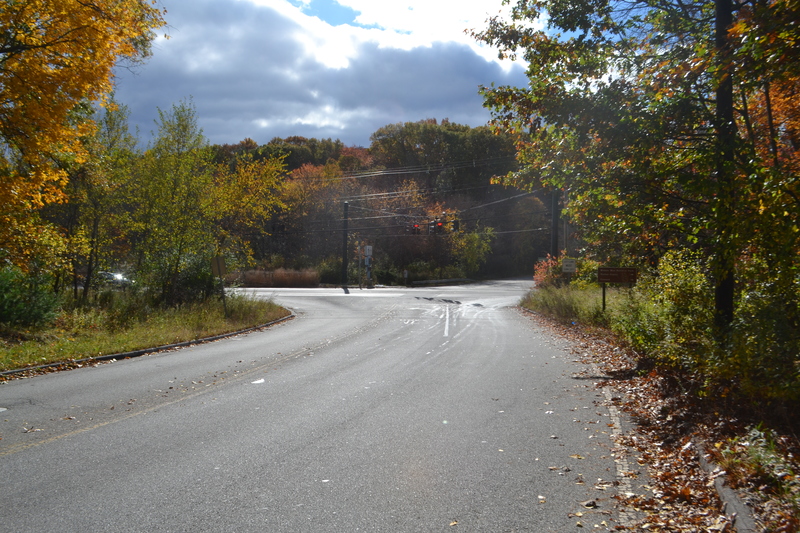 There were no sidewalks on this part of Mass. Ave. and many times Jamie and I questioned if cars coming inches by us at 50 miles per hour was worth it for journalism, or more specifically, to reach some point on some street that no one really seemed to care exists. I remember saying, ok there are cars coming by us, but at least Redcoats aren’t firing muskets at us, right? As a sidewalk for us to stand on was finally coming into our view, so was the beginning of the end of Mass. Ave. There was a tiny sign – the one that had been unnoticed on our drive in. (One that if we had noticed we wouldn’t have had to walk all the way in a long, roundabout route in the park). But, a little quest never hurt anyone.